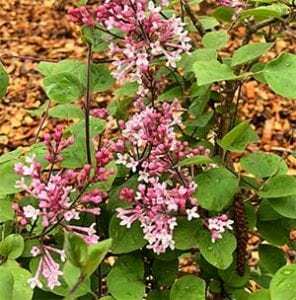 A lilac for smaller gardens Syringa meyeri ‘Palibin’ is a naturally compact plant that is is also very easy to grow. Forming a small rounded bushy shrub to around 1 metre (3 ft) in height with a similar spread this is also a lilac that is suited to growing in pots. In spring the plant puts on deep pink buds which open to the panicles of fragrant lilac pink flowers that cover the plant. Once established this is a very hardy plant, it grows welling full sun and thrives in a humus rich well drained soil. Dig the soil over well before planting, removing any weeds. Plant at the depth it was in the container. Water through the first few summers. Light tip pruning after flowering will help promote a bushy dense growth habit. The best way to propagate the Korean Lilac is from softwood cuttings taken in late springier by layering. Common Name – Korean lilac.’Palibin’ Lilac. Growth rate – low to medium. Foliage – Mid to Deep green – Deciduous.